This is an art form practiced in the area of Machilipatnam in Andhra Pradesh. 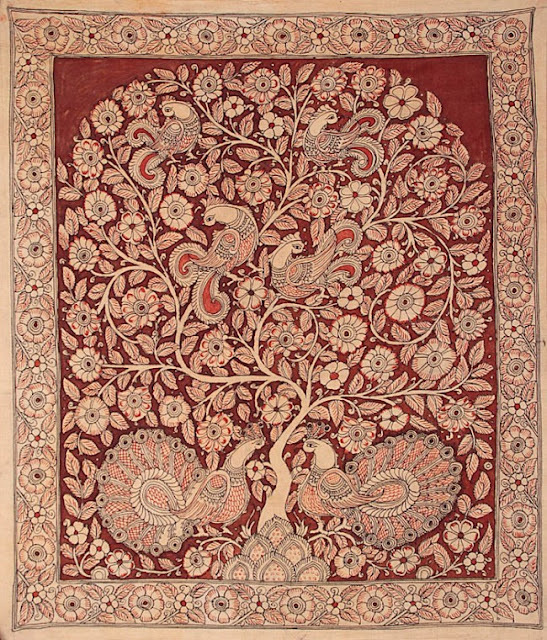 To start off Kalamkari means craftsmanship with the use of pen. In this art form pen is used to draw free hand drawings on a piece of cotton cloth. 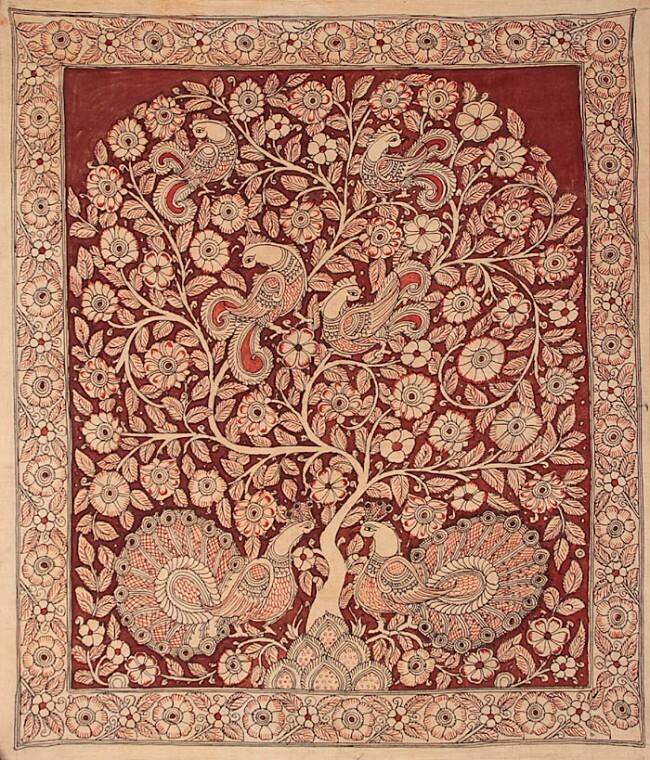 This art form evolved with the patronage of the Golconda sultanate and the Mighty Mughals. Many stories of epics can be seen drawn on a piece of cloth which range from Ramayana, Mahabharata, puranas and other mythological stories. This is a very old art form. The glossiness of the cotton cloth is obtained by immersing it in cow milk or resin for an hour or so. Then subsequently the colors are applied on the cloth and the painting starts. One of the most important and interesting aspects of the painting is that after each color is applied the Kalamkari is washed. This means the more the colors applied the more will be the washings. On an average the painting is washed 15-20 times before it is finally ready for use. 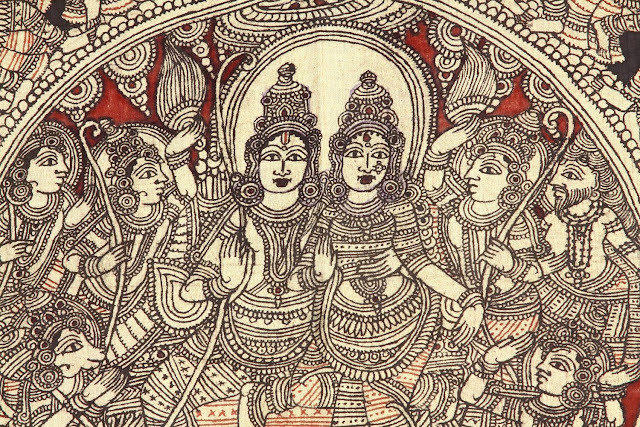 These are some of the many uses one can make of the beautiful masterpieces named the Kalamkari. My personal favorite for their use is using them as wall paintings. These paintings may be made on themes which might have stories such as of Ramayana, Mahabharata or other mythologies so having them in your drawing room gives it a different aura altogether. I was personally mesmerized when I saw such an exhibition at my cousin’s house wherein being an art enthusiast I couldn’t but glare at it till I could decipher what story it was portraying. Secondly, one would love to use these as bed sheets. Being made on cotton cloth these are a great option to glow up your bedrooms. They not only provide you with a range of options in terms of design but also let you decorate a very important part of your house, the bed. It’s comfortable and appealing when one sees it. One is sure to get complements if the bed is laden with beautiful art work. Thirdly, using them as framed god images in Mandirs is also a good option. 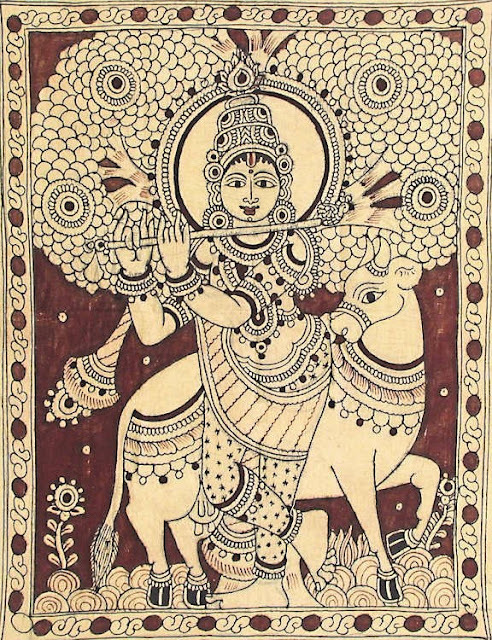 There are a variety of Kalamkaris which can be seen as having pictures of Gods and Goddesses. This aspect of the paintings can also be utilized for enriching our places of worship with not only divinity but also creativity and art. In the end various patterns which are not related to the religious beings can be used as covers and carpets especially in the drawing room. They can be the ornaments of the center table and enrich the house with a distinct flavor, the flavor of art and creations!